Life Fitness 95X Engage Elliptical Cross-Trainer features an innovative design with revolutionary Quiet Drive technology. 95X Engage Elliptical Cross-Trainer combines form with function and provides better output. The 95X Engage Elliptical Cross-Trainer adds comfort while providing an exceptional exercise experience. It is design to offer a total-body workout. It uses superior biomechanics and a natural fluid motion. 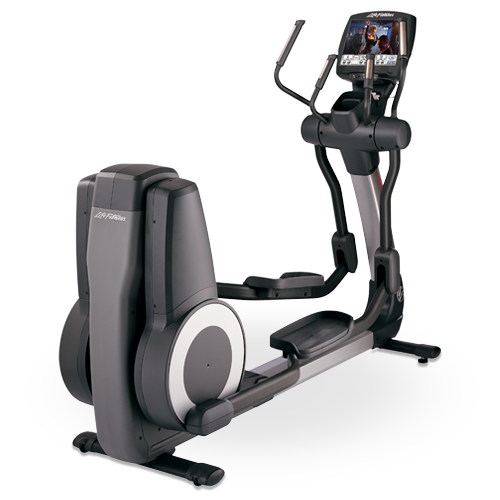 This cross trainer has integrated 15” Engage Console with touch screen technology, TV, iPod and iPhone audio/video, and FM radio at users’ fingertips. ToughTrain 3.5 out of 5 Though its is a heavy elliptical cross trainer yet it cost too much. Can be a best deal if bought in some discount. *Note: Most of the sites, stores or shopping portals listed above sell Life Fitness 95X Engage Elliptical Cross-Trainer with discounts and other exciting offers. There is a possibility that the some of above websites are not selling Life Fitness 95X Engage Elliptical Cross-Trainer now. Toughtrain.com is not liable for such cases or instances. Also we do not recommend any seller for Life Fitness 95X Engage Elliptical Cross-Trainer and a buyer should buy from where he/she gets best deal with quality of products, service and on time delivery (shipment).